You are here: Home / General News / If you go down to the Woods and Gardens today, your sure of a BIG surprise! If you go down to the Woods and Gardens today, your sure of a BIG surprise! Nigel’s work features strongly in the newly launched Hidden Gardeners Nature trail at Pinetum Gardens, St Austell, providing eight of the fourteen features on the trail. 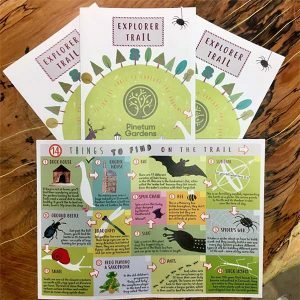 The new trail has been designed by the Cornish Adventure Trail Company, Spottydogtrails (spottydogtrails.com), it offers garden explorers of all ages the opportunity to discover these hidden gems among the gardens and woods .